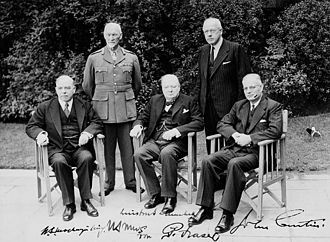 Depending on the definition chosen for these terms, a number of persons could alternatively be considered the inaugural holder of the office. Andrés Bonifacio could be considered the first President of a united Philippines since he was the third Supreme President (Spanish: Presidente Supremo; Filipino: Kataas-taasang Pangulo) of the Katipunan, a secret revolutionary society. Its Supreme Council, led by the Supreme President, coordinated provincial and district councils. When the Katipunan started an open revolt against the Spanish colonial government in August 1896, Bonifacio transformed the society into a revolutionary government with him as its head. While the term Katipunan remained, Bonifacio's government was also known as the Tagalog Republic (Spanish: República Tagala; Filipino: Republikang Tagalog). 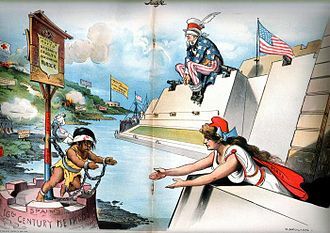 Although the word Tagalog refers to the Tagalog people, a specific ethno-linguistic group, Bonifacio used it to denote all non-Spanish peoples of the Philippines in place of Filipinos, which had colonial origins. Bonifacio's revolutionary government never controlled much territory for any significant period. Some historians contend that including Bonifacio as a past president would imply that Macario Sacay and Miguel Malvar should also be included. 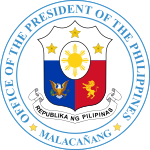 ^ "Agencies/Offices under the Office of the President". 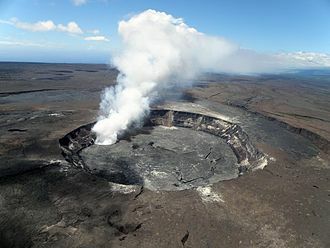 Presidential Communications Operations Office. Government of the Philippines. Retrieved Jan 6, 2016. ^ "NEW SPEAKER? Gloria takes seat at House rostrum, Alvarez welcomes Duterte". GMA News Online. Retrieved 2018-07-23. 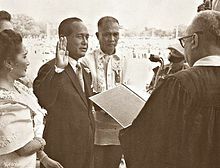 Diosdado Pangan Macapagal was the ninth President of the Philippines, serving from 1961 to 1965, and the sixth Vice-President, serving from 1957 to 1961. He served as a member of the House of Representatives and he is the father of Gloria Macapagal-Arroyo, who was the 14th President of the Philippines from 2001 to 2010. A native of Lubao, Macapagal graduated from the University of the Philippines and University of Santo Tomas and he first won election in 1949 to the House of Representatives, representing a district in his home province of Pampanga. In 1957, he became Vice-President under the rule of President Carlos P. García, Diosdado Macapagal was a reputed poet in the Chinese language, though his poetic oeuvre was eclipsed by his political biography. 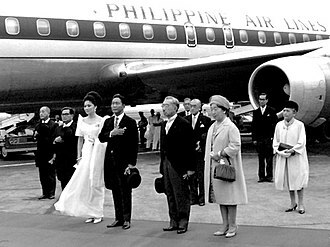 As President, Macapagal worked to suppress graft and corruption and to stimulate the Philippine economy and he introduced the countrys first land reform law, placed the peso on the free currency exchange market, and liberalized foreign exchange and import controls. Many of his reforms, were crippled by a Congress dominated by the rival Nacionalista Party and he stood for re-election in 1965, and was defeated by Ferdinand Marcos, who subsequently ruled for 21 years. He died of heart failure and renal complications, in 1997, Diosdado Macapagal was born on September 28,1910, in Lubao, the third of four children in a poor family. His father, Urbano Macapagal, was a poet who wrote in the local Pampangan language and he is a distant descendant of Don Juan Macapagal, a prince of Tondo, who was a great-grandson of the last reigning Lakan of the Kingdom of Tondo, Lakan Dula. The family earned extra income by raising pigs and accommodating boarders in their home, due to his roots in poverty, Macapagal would become affectionately known as the Poor boy from Lubao. Diosdado Macapagal was a poet in the Spanish language although his poet work was eclipsed by his political biography. Macapagal excelled in his studies at public schools, graduating valedictorian at Lubao Elementary School. While in law school, he gained prominence as an orator, however, he was forced to quit schooling after two years due to poor health and a lack of money. Returning to Pampanga, he joined boyhood friend Rogelio de la Rosa in producing and starring in Tagalog operettas patterned after classic Spanish zarzuelas and it was during this period that he married his friends sister, Purita de la Rosa in 1938. He had two children with de la Rosa and Arturo, Macapagal raised enough money to continue his studies at the University of Santo Tomas. 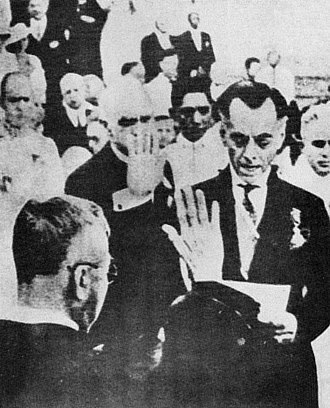 He gained the assistance of philanthropist Honorio Ventura, the Secretary of the Interior at the time, after receiving his Bachelor of Laws degree in 1936, he was admitted to the bar, topping the 1936 bar examination with a score of 89. 95%. 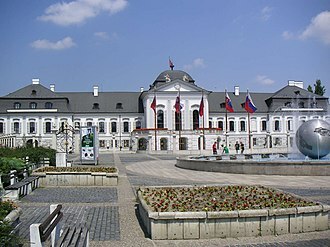 He returned to his alma mater to take up studies and earn a Master of Laws degree in 1941, a Doctor of Civil Law degree in 1947. 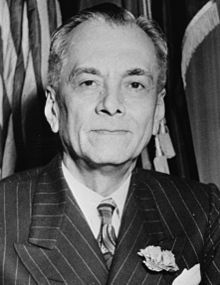 After passing the bar examination, Macapagal was invited to join an American law firm as a practicing attorney and he was assigned as a legal assistant to President Manuel L.
Manuel Acuña Roxas was the fifth President of the Philippines who served from 1946 until his death in 1948. Roxas was married to Trinidad de Leon at Our Lady of Remedies Church located at Barangay Sibul, San Miguel, the couple had two children, Ma. Rosario, who married Vicente Roxas and Gerardo Manuel, who married Judy Araneta and his son, became a member of the Philippine House of Representatives and a leader of Liberal Party of the Philippines. Gerrys sons, Manuel II and Gerardo, Jr. served as representatives from Capiz, in 2004, Mar became a Senator and was elected president of the Liberal Party. His daughter-in-law, continues to be a prominent and driving force of the Liberal Party, Roxas was a descendant of Antonio Roxas y Ureta, the brother of Domingo Roxas y Ureta. - grandson, Philippine congressman Prominent relatives from the line of Antonio Roxas y Ureta, Felix Roxas y Arroyo, son of Antonio Roxas y Ureta and father of Felix Roxas and he was the first Filipino qualified architect. Felix Roxas, Jr.
y Fernandez, son of Felix Arroyo Roxas, Sr. and he was mayor of Manila from 1905 to 1917. 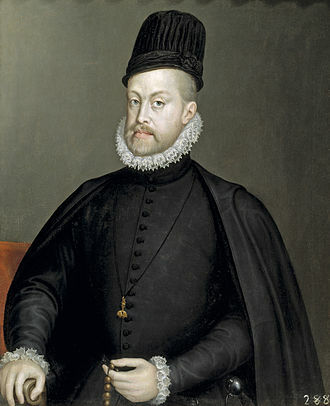 Felipe Roxas y Arroyo, son of Antonio Roxas y Ureta and he was the painter who emigrated to Paris. Francisco L. Roxas y Reyes, son of Juan Roxas y Arroyo and he was a businessman and one of the thirteen martyrs of Bagumbayan. Monsignor Éric de Moulins-Beaufort, great-great-grandson of Francisco L. Roxas and he is the Auxiliary Bishop of Notre-Dame de Paris since 2008. Maria Margarita Moran-Floirendo y Roxas, globally known as Margie Moran, Prominent relatives from the line of Domingo Roxas y Ureta, brother of Antonio Roxas, Margarita Roxas-de Ayala y Ubaldo, daughter of Domingo Roxas who married Antonio de Ayala. She was considered the first Filipino philanthropist and the greatest businessperson of her time and she was the matriarch of the Roxas-de Ayala family. 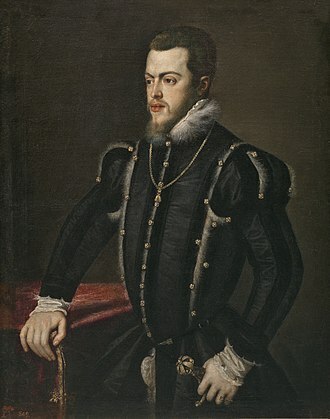 José Bonifacio Roxas y Ubaldo, younger brother of Margarita Roxas de Ayala, in 1851, he would purchase the former Jesuit estate of Hacienda de San Pedro de Macati, which would become the basis of the Zóbel de Ayala family wealth. Aquino was the most prominent figure of the 1986 People Power Revolution, which toppled the 21-year authoritarian rule of President Ferdinand E. Marcos and restored democracy to the Philippines. She was named Time magazines Woman of the Year in 1986, prior to this, she had not held any other elective office. A self-proclaimed plain housewife, she was married to Senator Benigno Aquino and she emerged as leader of the opposition after her husband was assassinated on August 21,1983 upon returning to the Philippines from exile in the United States. In late 1985, Marcos called for elections, and Aquino ran for president with former senator Salvador Laurel as her Vice-President. 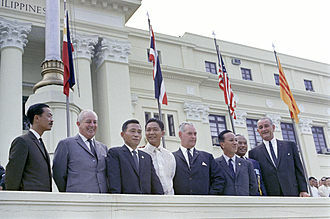 Defections from the Armed Forces and the support of the local Catholic hierarchy led to the People Power Revolution that ousted Marcos, as President, Aquino oversaw the promulgation of the 1987 Constitution, which limited the powers of the Presidency and re-established the bicameral Congress. Her administration gave strong emphasis and concern for civil liberties and human rights and her economic policies centred on restoring economic health and confidence and focused on creating a market-oriented and socially responsible economy. 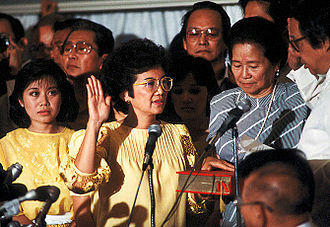 Aquino faced several coup attempts against her government and various natural calamities until the end of her term in 1992 and she was succeeded as President by Fidel V. Ramos, and returned to civilian life while remaining public about her opinions on political issues. In 2008, Aquino was diagnosed with cancer from which she died on August 1,2009. She was survived by her son, Benigno Aquino III, who was President of the Philippines from June 30,2010 to June 30,2016. Throughout her life, Aquino was known to be a devout Roman Catholic, Maria Corazon Sumulong Cojuangco was born on January 25,1933 in Tarlac and was the sixth of eight children of José Cojuangco, a former congressman, and Demetria Cojuangco, a pharmacist. Her siblings were Pedro, Teresita, Jose Jr. both Aquinos parents came from prominent clans. Her father was a prominent Tarlac businessman and politician, and her grandfather, as a young girl, Aquino spent her elementary school days at St. Scholasticas College in Manila, where she graduated on top of her class as valedictorian. She transferred to Assumption Convent to pursue high school studies, afterwards and her family went to the United States and attended the Assumption-run Ravenhill Academy in Philadelphia. In 1949, she graduated from Notre Dame Convent School in New York and she pursued her college education in the U. S. graduating from the College of Mount Saint Vincent in 1953 in New York, with a major in French and minor in mathematics. 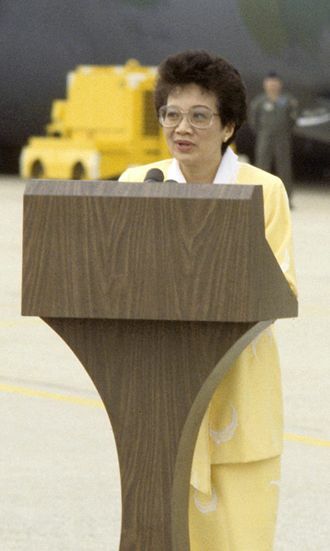 During her stay in the United States, Aquino volunteered for the campaign of U. S, republican presidential candidate Thomas Dewey against Democratic U. S. President Harry S. Truman during the 1948 U. S. After graduating from college, she returned to the Philippines and studied law at Far Eastern University in 1953 and she met Benigno Ninoy S. Aquino, Jr. —son of the late Speaker Benigno S. Aquino, Sr. and a grandson of General Servillano Aquino. She discontinued her law education and married Ninoy in Our Lady of Sorrows church in Pasay on October 11,1954, the couple raised five children, Maria Elena, Aurora Corazon, Benigno Simeon III, Victoria Elisa and Kristina Bernadette. Rodrigo Rody Roa Duterte, known as Digong, is a Filipino politician and jurist who is the 16th and current President of the Philippines. He is the first Mindanaoan to hold the office, and the fourth of Visayan descent, at 71 years old, Duterte is the oldest person to assume the Philippine presidency, eclipsing Sergio Osmeñas age of 65. Duterte studied political science at the Lyceum of the Philippines University, graduating in 1968, Duterte was among the longest-serving mayors in the Philippines, serving seven terms totaling more than 22 years in office. Duterte has alternately confirmed and denied his involvement in the killings, Duterte has repeatedly confirmed that he personally killed three kidnapping suspects while Mayor of Davao in 1988. On May 9,2016, Duterte won the Philippine presidential election with 38. 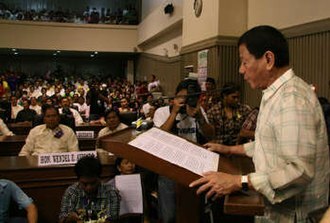 5% of the votes and his domestic policy has focused on combating illegal drug trade by initiating the Philippine Drug War. He has vowed to pursue an independent foreign policy, Duterte was born on March 14,1945, in Maasin. His maternal grandfather was a Chinese immigrant from Xiamen and his father was Vicente G. Duterte, a Cebuano lawyer, and his mother Soledad Duterte, was a school teacher from Cabadbaran, Agusan and a civic leader of Maranao descent. 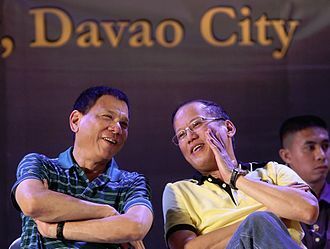 Dutertes father was acting mayor of Danao and subsequently the governor of Davao province. Rodrigos cousin Ronald, on the hand, served as Cebu City mayor from 1983 to 1986. Ronalds father, Ramon Duterte, held the position from 1957 to 1959, the Dutertes consider the Cebu-based political families of the Durano and the Almendras clan as relatives. Duterte has relatives from the Roa clan in Leyte through his mothers side, before they resettled to Davao, Dutertes family briefly lived in his birthplace in Maasin, and in his fathers hometown in Danao, until he was four years old. The Dutertes initially moved to Mindanao in 1948 but still went back and they finally settled in the Davao Region in 1950. Vicente as a lawyer engaged in practice, while Soledad taught in public schools as a teacher. Joseph Erap Ejercito Estrada is a Filipino politician who served as the 13th President of the Philippines from 1998 to 2001 and as the 9th Vice President of the Philippines from 1992 to 1998. He has been Mayor of the City of Manila, the countrys capital, Estrada was elected President in 1998 with a wide margin of votes separating him from the other challengers, and was sworn into the presidency on June 30,1998. In 2000 he declared an all-out-war against the Moro Islamic Liberation Front and captured its headquarters and he ran for president again in the 2010 presidential election, but placed second behind Senator Benigno Aquino III. José Marcelo Ejército Sr. was born at 8,25 PM on April 19,1937 at Manuguit Maternity Hospital in Tondo and his family moved to the wealthy suburb of San Juan. He belonged to a family, and was the eighth of ten children of Emilio Ejercito Sr. and his wife. Emilio Ejercito Sr. transferred to Central Colleges of the Philippines, in his twenties, he began a career as a drama actor. He adopted the stage name Joseph Estrada, as his mother objected to his chosen career and his decision to quit schooling. Estrada is married to former First Lady-turned-senator Dr. Jorge Ejercito, actor E. R. Ejercito, son of George Estregan and nephew, Mayor of Pagsanjan, gary Ejercito, nephew and Board Member of Quezon province. Gherome Ejercito, basketball player Estrada played the role in more than 100 movies. He was the first FAMAS Hall of Fame recipient for Best Actor and he often played heroes of the lower classes, making him popular among several impoverished citizens. This proved advantageous to his political career and he founded, together with Guillermo de Vega, the first Metro Manila Film Festival in 1975. His administration was marked by unequaled accomplishments in infrastructure development and he relocated some 1,800 squatter families out of San Juan to Taytay, Rizal, at no cost. 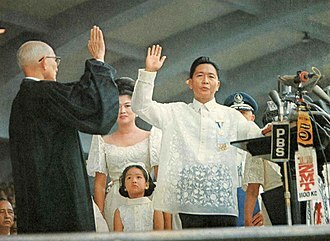 He was the first mayor to computerize assessment of the Real Estate Tax in the Municipal Assessor’s Office, when Corazon Aquino assumed the presidency in 1986, all elected officials of the local government were forcibly removed and replaced by appointed officers-in-charge, including Estrada. 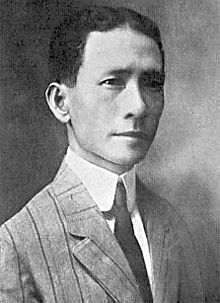 Ramon del Fierro Magsaysay, Sr. was the seventh President of the Republic of the Philippines, serving from December 30,1953 until his death in an aircraft disaster. An automobile mechanic, Magsaysay was appointed governor of Zambales after his outstanding service as a guerilla leader during the Pacific War. He served two terms as Liberal Party congressman for Zambales before being appointed as Secretary of National Defense by President Elpidio Quirino and he was elected President under the banner of the Nacionalista Party. He was the first Philippine President born during the 20th century, Ramon del Fierro Magsaysay was born in Iba, Zambales on August 31,1907 to Exequiel Magsaysay y de los Santos, a blacksmith, and Perfecta del Fierro y Quimson, a schoolteacher. He spent his school life somewhere in Castillejos and his high school life at Zambales Academy in San Narciso. 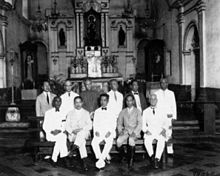 After high school, Magsaysay entered the University of the Philippines in 1927 and he worked as a chauffeur to support himself as he studied engineering, and later, he transferred to the Institute of Commerce at José Rizal College, where he received a baccalaureate in commerce. He worked as a mechanic in a bus company. At the outbreak of World War II, he joined the pool of the 31st Infantry Division of the Philippine Army. When Bataan surrendered in 1942, Magsaysay escaped to the hills, There he organised the Western Luzon Guerrilla Forces, and was commissioned captain on April 5,1942. 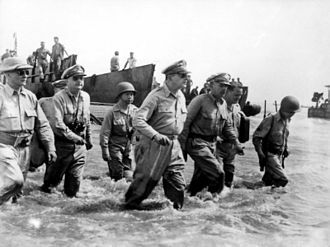 Magsaysay was among those instrumental in clearing the Zambales coast of the Japanese prior to the landing of American forces together with the Philippine Commonwealth troops on January 29,1945. He was married to Luz Magsaysay on June 16,1933, several of Magsaysays relatives became prominent public figures in their own right, Ramon Magsaysay, Jr. 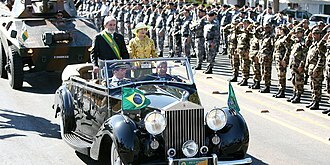 In the so-called dirty election of 1949, he was re-elected to a term in the House of Representatives. During both terms he was Chairman of the House National Defense Committee, in early August 1950, he offered President Elpidio Quirino a plan to fight the Communist guerillas, using his own experiences in guerrilla warfare during World War II. United States President Barack Obama, with President Aquino and Vietnamese President Nguyễn Minh Triết, at a working lunch with leaders of the Association of Southeast Asian Nations around the United Nations General Assembly Meeting in New York City in 2010. United States Secretary of State Hillary Clinton delivers remarks at the Millennium Challenge Corporation (MCC) compact agreement signing ceremony with President Benigno S. Aquino III at the Waldorf-Astoria Hotel in New York City, on September 23, 2010. President Aquino and Pope Francis at Malacañang on January 16, 2015. President Aquino meeting with U.S. President Barack Obama, at the Malacañang Palace upon his state visit to Manila, 2014. Estrada (center, back row) with members 10th City Council of Manila in July 13, 2016. Elected in 2013 as Mayor of Manila, he was reelected again in 2016.